The plant that produces most of the hay-fever symptoms in eastern North America is ragweed. Three characteristics make this tall, shaggy plant such a powerful source of allergic symptoms. First, ragweed produces a large amount of pollen compared to many other plants. Second, ragweed pollen is more allergenic, or capable of generating allergic reactions, than grass pollen and other common causes of hay fever. Third, ragweed pollen is designed for dispersion, enabling it to travel far and wide on the wind. The most conspicuous of the ragweed species is giant ragweed, or Ambrosia trifida, which grows up to 15 feet (five metres) tall. Also called crown-weed or tall ragweed, it’s found as far east as Quebec and as far west as British Columbia. 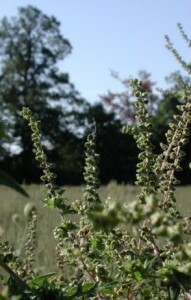 Short ragweed, or Ambrosia artemisifolia, is more abundant in eastern Ontario than its taller relative. Also called common ragweed or dwarf ragweed, this plant grows throughout Canada. it thrives in fertile soils along road-sides, in fallow fields and in other rural areas that have been disturbed by human activities. Short ragweed also invades urban environments, populating vegetable gardens and vacant lots. Ragweed pollen grains are the spherical male cells of the flowering ragweed plant. The cells are tiny – less than 50- microns in size. Light, dry and powdery, ragweed pollen is ideally adapted to being carried by the wind to another plant, where it pollinates a flower’s female cells and starts another generation of ragweed. The “pollen count” that’s part of a summer weather report measures airborne pollen levels as grains per cubic metre of air. While some allergy sufferers develop symptoms when pollen levels are low, others do not respond until levels are very high. Generally, as pollen counts rise, so does the incidence and severity of allergy symptoms. In eastern Ontario, ragweed is primarily a problem in rural areas and towns below the Canadian Shield, where soils are more fertile and more frequently disturbed by agriculture and other activities. During ragweed season, the Kingston region has a high level of ragweed pollen. This abundance is because of Kingston’s fertile agricultural surroundings and the modest size of the urban centre. Larger centres like Toronto tend to have less pollen at street level because of thermal updrafts.